Revolution is not a word that most people would easily associate with Elsa Pooley. Her infectious smile, gentle manner and ever willingness to assist are the antithesis of an activist obsessed with overturning the unnatural order. Nevertheless appearances in Elsa’s case are definitely deceptive because during the past 50 years she has been at the forefront of a seismic change which has seen a significant shift from the traditional exotic choice in gardening to the indigenous. Not only has she led the uprising by developing her own and her clients’ indigenous gardens through her landscaping consultancy but her iconic books have influenced thousands of individuals to join the rebellion and spawned countless supporters for the cause. A cause that not only goes well beyond the relative superficiality of the type of garden one chooses, but also digs deeply into the heart of our biodiversity, its survival and ultimately its co-existence with the humans that inhabit this rich but damaged planet. Elsa’s destiny as a revolutionary was not pre-determined by birth but was gently nurtured and shaped by three important figures in her life. Born in Johannesburg but as well-travelled as her father, a well-known journalist who covered politics, agriculture and wildlife in SA, Elsa’s exposure to the natural world came firstly through her parents who were keen environmentalists in a practical sense. They loved gardening and the outdoors and took their five children to explore natural areas every weekend, both near and far. This love of nature and the vast diversity that made this country such a unique place in her parent’s universe has shaped the close orbit of those memories throughout her life. During the genesis of her first book she recalls a comment from her sister Creina, when working on the final layout of the Trees of Natal book. There was no photograph of the whole tree of the Giant Leaved Fig (Ficus lutea). Elsa reminded Creina that it was the iconic tree of Durban – with magnificent specimens in the city centre near the Durban City Hall which the family had visited when she was a child. “But you were just 6 years old then!” she remembers her sister remarking in amazement. Her family’s enthusiasm for South Africa’s wild places ultimately led her to meet and marry the third most influential figure in her life, Tony Pooley, a game ranger who later became internationally known as an expert on the Nile crocodile. Tony was an old-school game ranger in the heady days of the pioneering Natal Parks Board in a long-gone era where administrators and field staff were intensely passionate about the protection of vast territories and the fauna and flora they were entrusted with, and exhibited little regard for their own safety or their financial well-being. It was in the botanical and avian jewel of Ndumo Game Reserve, where he worked in the 60s and 70s, that Elsa began to nurture and advance her budding curiosity in plants and it was inevitable that the interest which her parents had inculcated into her, began to take root and blossom, under Tony’s guidance and encouragement. Relatively isolated, with no telephone, radio or TV, an erratic postal service and left to their own devices, Elsa began recording the highly diverse vegetation of the area. At that time there were no books on the region’s plants – just a slim black and white guide called Trees & Shrubs of Kruger National Park by L.E.W. Codd, and Cythna Letty’s book Wild Flowers of the Transvaal, and definitely no practical field guides for the untrained. Tony’s well known meticulousness for precise observation and note-taking eventually branched out to Elsa who was encouraged to take her own notes and to start drawing the more attractive or useful species she came across. Tony’s patience at helping her name plants seemed endless until one day she remembers asking him to identify a Marula tree. “Identify it yourself!” he responded with a twinkle in his eye, handing her a slim volume of Trees and Shrubs of KNP. Tony believed you had a duty to record your knowledge as well as to share it with others. His gentle prodding was to kick-start her life-long passion for working with plants of the region. It was this process of self-learning that nudged her onto the more interesting “roads less travelled” by others. With no formal training to reassure her, but driven by her passion and desire to learn, Elsa began to collect her first samples and fumble with her first rudimentary pressings. History is replete with stories of men and women who were rejected by their contemporaries only to forge their own futures. Determined even at a very young age, Elsa took this in her stride and immediately re-directed her investigation to the then University of Natal Herbarium in Pietermaritzburg where she met Olive Hilliard. This was the beginning of a life-long symbiotic friendship which has endured to this day. 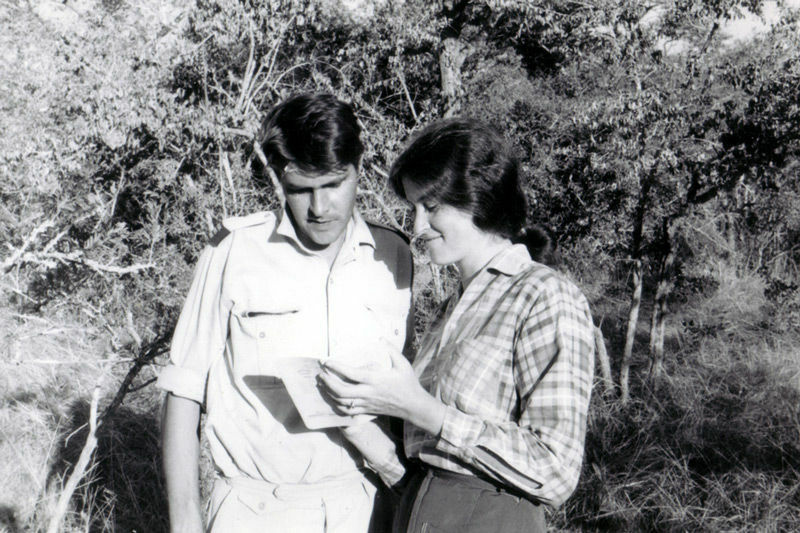 Dr Hilliard, who was to become one of South Africa’s leading botanists and taxonomists, and was the first person to describe Kloof’s very own Streptocarpus molweniensis, quickly sensed the driving force in this young woman so she began teaching her the methodology of sample collecting, compressing of plant fragments and fertilized an already hungry mind with books, materials and endless encouragement. Olive would take Elsa to the herbarium cupboards, teaching her to look for family and genus characteristics in what was to germinate slowly into an ‘in house’ education! These visits were to become the highlights of Elsa’s infrequent journeys to Pietermaritzburg during the 66-hour “leave breaks” they were allowed each month in lieu of working weekends. She fondly recalls how she would prepare and collect her samples with great excitement and pack them for the visit, in the expectation of guidance and help, which she received in abundance. There she also met the late Kath Gordon-Gray, a leading botanist who was also very generous in sharing the expertise that would help to expand Elsa’s library of knowledge. 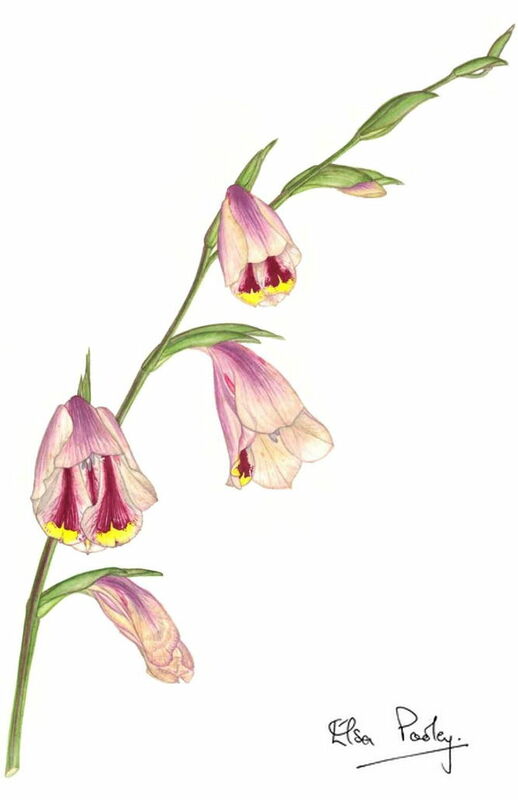 Whilst plants were a great passion for Elsa, so was the art of painting the various species she collected. With no formal training other than her Matric drawing classes, and greatly encouraged by husband Tony, Elsa soon developed her own methodology and artistic style. She remembers with clarity the first species she sketched, an Ornithogalum longibracteatum complete with bulb, flower and long flowing leaves. She soon collected a wealth of material to draw and describe and discovered, to her delight, that her work would prove immensely useful to the botanists in Pietermaritzburg. Having developed her passion for plants in a botanically rich environment such as Ndumo Game Reserve, it was a natural progression for Elsa to start cultivating and developing her own gardens with indigenous species. Tony was ahead of the times by wanting to use only local plants in the gardens around the various houses they lived in at Ndumu, Mkhuze and Eastern Shores of Lake St Lucia. When Elsa had sketched and painted the plants and made herbarium specimens, the obvious next step was to grow them. This was not always a popular choice at the time and she recalls her first “experiment” in indigenous gardening with some amusement. year at Mkhuze. The new ranger in charge was keen to put indigenous plants into the camp gardens. However, his wife, a keen gardener, was only growing exotic garden plants at her thatched home because she did not know what else was available. It was not uncommon in the 1960s and early 1970s for Natal Parks Board rest camps to be well stocked with exotics, ostensibly because their colour pleased the paying visitors. Elsa was able to share her knowledge of the many and lovely wild flowering plants and the two ladies soon appropriated workers, equipment and plants. They promptly removed all the exotics to landscape a lush indigenous garden and redesign the roads in the camp to open up the park-like grounds with a new parking area away from the rest huts. Off course the distance was less than 50 metres and with the remarkable indigenous vegetation to admire, most visitors soon began to enjoy and appreciate the gorgeous variety of plants that they were being ‘forced’ to walk through! Somewhere in the late 70s Elsa collected a sample of a strange species she could not readily identify. The plant had an unusual turpentine-like fragrance and she noted that it was aggressively spreading in many places throughout Northern Zululand. She soon discovered that this was the notorious Chromalena odorata which was to wreak havoc in that region including the Protected Area. Within a matter of years, crocodile nesting grounds were threatened and the game reserves were spending millions to try and control its spread into the grasslands and bushlands. This incident was a stern warning of the damaging potential inherent in invasive alien species and reinforced her commitment to plant and promote indigenous varieties. Of course, the aggressive nature of invasive alien species had been known for many years. That knowledge was available as far back as the late 19th century, particularly in the Western Cape, but that very little official reaction was forthcoming until the 1980s. By this time the alien invasion had proliferated into vast populations that were becoming a real threat to the more placid inhabitants of the planet. Elsa acknowledges that to counter-attack the alien invasion there has to be meaningful progress on the planting of indigenous species. She also expresses concern that the advancement of indigenous gardening may have slowed down in the past few years, possibly as a result of insufficient new information and the rather limited range of indigenous species which have been commercialised. She bemoans the public’s constant desire for bright colours which are often in strong contrast to the harmony of our natural surroundings. Here the countless shades of green interspersed with subtle colour from our many colourful indigenous species provides an infinitely more soothing environment, particularly in our hot climate. Responding to a question as to why so few nurseries sell indigenous species and on the paucity of the range available, Elsa attributed this to a lack of knowledge on the part of the horticulturists who often recommend exotic species they know. The planting of exotics appears to be in-bred in most South African home owners and to a large extent is a consequence of our colonial past. We like to plant what our grandparents planted. What we most probably grew up with were showy bougainvilleas, ostentatious roses and profuse petunias: flowers that feature strongly in our collective memories. Whilst Elsa does not object to her clients requesting exotic species in their gardens, she personally favours the planting of “locally indigenous” which is in synchrony with Kloof Conservancy’s own philosophy. 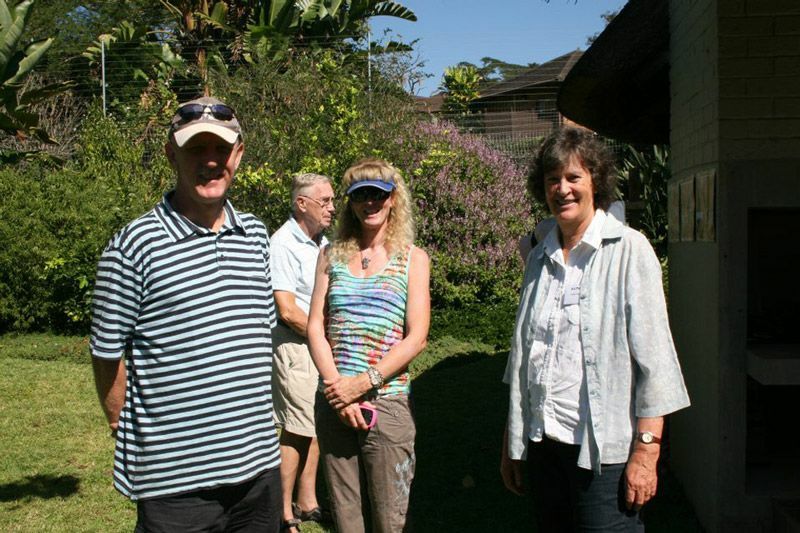 Elsa has been a very strong supporter of Kloof Conservancy’s Indigenous Open Gardens Event and has attended almost every year since its inception. She views this occasion as an important stimulant to educate and inspire the public and feels strongly that its impact has gone far beyond the borders of the Upper Highway. She has therefore urged Kloof Conservancy to continue with this significant and influential annual display. Elsa credits the late Sima Eliovson, the doyenne of South African garden writing, as possibly the first person to start influencing the trend towards indigenous gardening with her then popular book: Discovering Wild Flowers in Southern Africa published in 1962. It was the absence of any meaningful guide book however that spurred Elsa to consider writing a practical field guide on the plants of Eastern South Africa. By the late 80s she had assembled a formidable volume of notes, sketches and her botanical art was also selling well in specialist circles. But it was inevitable that she would be prompted to organise all she knew into a book that would draw many admirers. It was Elsa’s husband Tony who provided the stimulus and encouragement that reminded her that she should share the extensive knowledge she had gained in the field. 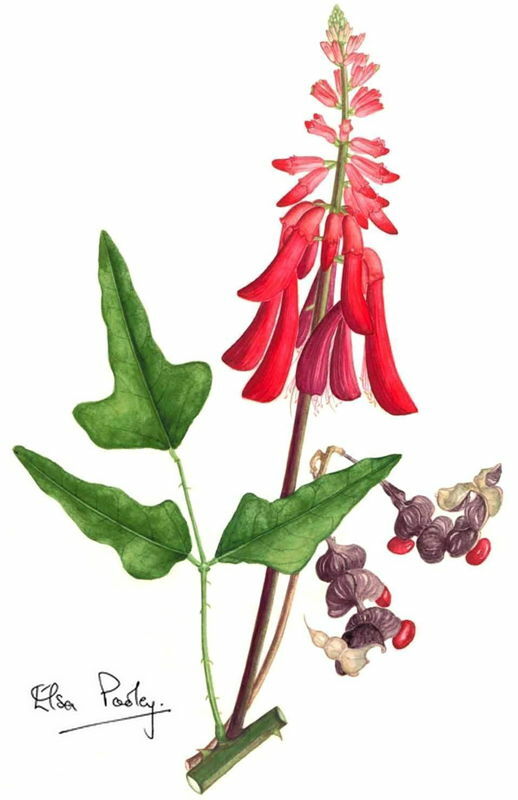 Her early plans were to produce a book covering all woody plants and flowers using her hand-drawn illustrations but commercial realities in terms of the cost and marketability of such a book necessitated a change in plans. “I met with a group of friends and colleagues to discuss the list of plants I thought I could fit into one book. Over dinner it was agreed that a true field guide covering all the species in Natal was not going to be commercially viable. It would be better to publish firstly a book on trees, followed by one on Wild Flowers. Books on trees have an established ‘market,’ much like bird books. So together with a dedicated group of like–minded individuals – Geoff Nichols, Trevor Coleman and David Johnson – we set about planning the tree book for which they already had a lot of photographs. The group then suggested that I write the books and they would provide photographs and add their knowledge of the plants to the text. The ‘working’ group expanded over time to include Tony Abbott, Wally Menne and Rosemary Williams and I had to move into new territory, which was knocking on donors’ doors to set up a trust to fund the publications. Fortunately the appeals to sponsors were positively received and the Flora Publications Trust (today known as the Flora and Fauna Publications Trust) was established in 1992 under the valuable guidance of the late Michael Noyce. The first edition of The Complete Field Guide to Trees of Natal Zululand & Transkei was on the bookshelves in 1993 and was an instant success with the public who welcomed the non-technical language and easy-to-use format. 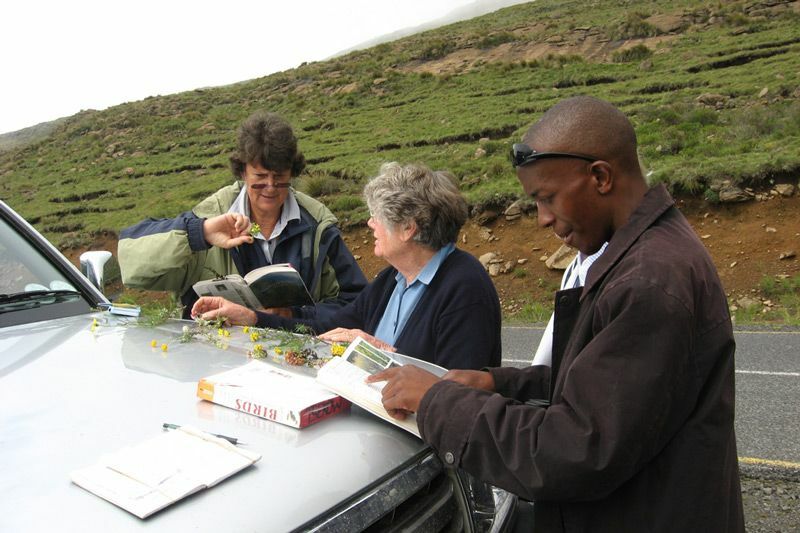 This was followed by A Field Guide to Wild Flowers KwaZulu-Natal and the Eastern Region. Today the trust publishes an important range of affordable books covering the flora and fauna of KwaZulu-Natal which include best sellers Bring Nature Back to your Garden by Charles and Julia Botha. It cannot be overstated how influential these books have been in popularising indigenous gardening. Their authors provide information in an easily readable and understandable format together with clear photographs making plant identification and selection relatively simple for the non-expert. In addition the books have become the basic reference “bibles” for indigenous gardeners in KwaZulu Natal and many customers at nurseries can be seen walking about with a well dog-eared copy in their hands! Elsa is the first to acknowledge that all her books are the result of huge collaborative efforts with other well-known botanists and enthusiastic amateurs who toil hard, often with no financial reward, to help produce these invaluable works of reference. It must be recognised, however, that she brought a much needed freshness to the genre which, coupled with the “untechnical” language and the artistic touch, launched these books into popular appeal. In that regard she is currently working together with Geoff Nichols and Andrew Hankey on a new book on indigenous garden plants of South Africa. Her track record and continuing popularity in the botanical world and beyond underpin the enormous contribution that Elsa has made in inspiring an indigenous gardening uprising and at the same time protecting the biodiversity in KwaZulu-Natal. Elsa may have started as a reluctant revolutionary but she has drawn thousands of believers to her cause and deserves the respect and admiration that is part and parcel of being a true member of the Eco-Impi. In 1996 Elsa was named the KZN Wildlife and Environment Society’s Conservationist of the Year. In 1999 she was awarded the Certificate of Merit for Outstanding Contribution to Botany by the SA Association of Botanists. 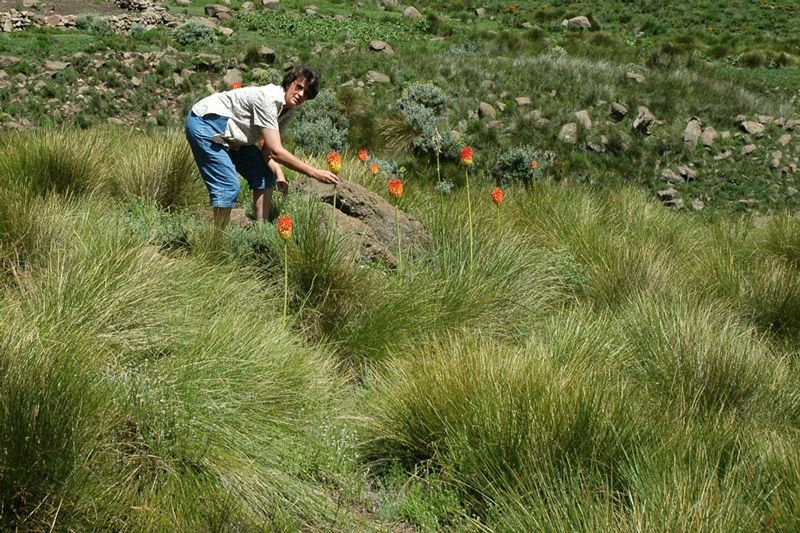 In 2004 she was awarded the Marloth Medal of the Botanical Society of South Africa. 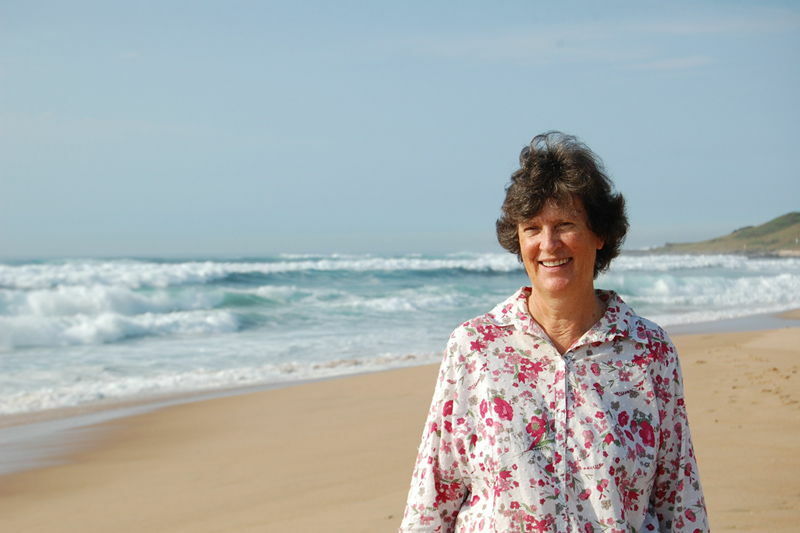 In 2008 the University of KwaZulu-Natal awarded her an Honorary Doctorate of Science and this year the Durban Botanic Gardens Trust awarded her the John Medlely Wood Medal for her exceptional service to Botany and the flora of KwaZulu Natal. 2015 November 2015, Ezemvelo KZN Wildlife External Excellency Award – Life Time Achiever for ‘her magnificent efforts and all she has done to promote the conservation of the flora of KwaZulu-Natal’.